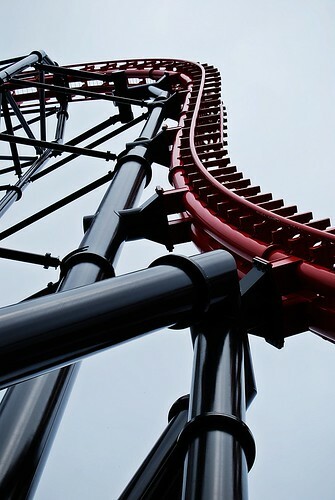 This is the 90-degree drop of the "Eejanaika" ride at Fuji-Q Highlands. It is classified as a 4-dimension rollercoaster because aside from the usual normal/upside-down/sideways loop, the seats also rotate vertically; thus, giving you a '4d' perspective. This is actually my favorite of all rides. I really love the part where the seats turn vertically backward and you have no choice but to see the world upside down.